Sarah Olson joined our practice in March 2017 with over 13 years experience working in optometry offices. Her caring and friendly personality will make your time spent at our office a pleasure. 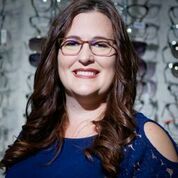 She enjoys helping people with their eye care needs and making them feel and look good in their eyewear choices. She is married and has three very active children in activities including year-long baseball, competitive cheer, and karate. In her spare time, Sarah likes to go camping, read and spend time with her family and friends.